The multi-platform adventure through time continues! Dak, Sera, and Riq return to the United States and walk immediately into a deadly trap. The year is 1850, and the nation is divided over the issue of slavery. In these dark days, the Underground Railroad provides a light of hope, helping runaway slaves escape to freedom. But the SQ has taken control of the Underground Railroad from within. Now Dak and Sera are left wondering who to trust . . . while Riq risks everything to save the life of a young boy. Book includes an all-new, full-color Hystorian's Guide - your key to unlocking the third episode of the action-packed Infinity Ring game! Dak, Sera and Riq have just escaped their last adventure and are ready to address the next Break. This lands them in the US in 1850, and when they seek shelter in what appears to be a Quaker household, they find that SQ has infiltrated many of the safe houses of the Underground Railroad, and slaves everywhere are in danger. Riq is assumed to be a slave and taken to be auctioned off with Kissy and her baby and young son James. Sera and Dak locate another Hystorian, and try to figure out what needs to be done to fix the Break, but Riq has an even bigger stake in this time period-- Remnants of memory are coming back to him, and he realizes that Kissy is actually an ancestor of his. If he doesn't save her, he may not exist at all. 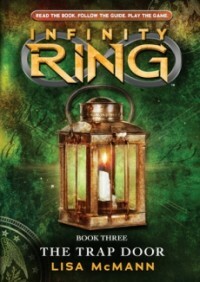 There are some technological problems along the way with the SQuare and Infinity Ring, and SQ's interference (as well as Dak's tomfoolery) don't help matters, but the trio survives and are ready for their next adventure, Curse of the Ancients by Matt de la Pena, which will be published in June. This book had lots of action, and lots of good historical facts presented in an easy-to-swallow fashion. Like the 39 Clues books, this is highly addictive series, and the online gaming component and trading cards draw in students who otherwise might not be as interested in historical fiction. I also like that different writers contribute to the series-- it's interesting to see how their styles compare and contrast.